April is National Volunteer Month, and in honor of that, TODAY is kicking off the new series "One Day, One Deed," taking a look at people who are inspired to give back and the impact of their good deeds. One self-described “weird artsy guy” is giving sick kids and their families new reasons to keep dreaming big. Through his Drawing Hope Project, Canadian artist Shawn Van Daele takes sick children's drawings and turns them into artistic, fantastical scenes using his photography and photo editing skills. The result? Stunning portraits of the kids living out their wildest dreams, never mind their earthly limitations. 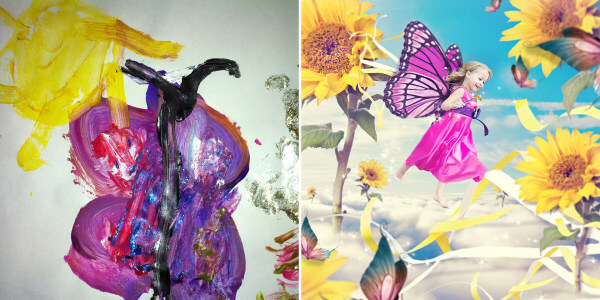 Through his Drawing Hope Project, Canadian artist Shawn Van Daele captures photos of sick kids, and edits them into fantastical environments. The Drawing Hope Project was off and running from there. Van Daele reached out to hospitals and support groups, who put him in touch with families who might be interested in his project. Once he created his first magical image (for Ryley, the "Queen of Hearts"), word spread quickly. Van Daele began working with children waiting for organ transplants, others with heart defects, cancer, “and every other kind of rare disease you could imagine,” he said. He offers his art free of charge. The response has been “overwhelming in the most perfect way possible,” Van Daele said, and he’s worked with about 30 families in Canada and the U.S. “Seeing the children's reactions to having their imaginations come to life is priceless — and for the parents, seeing their children full of hope and life is a real gift that I've been blessed with being able to give them,” he said. In addition to raising spirits, Van Daele also wants to raise awareness about organ donation. Many of the children he photographs are waiting for a life-saving transplant. All his images include messages urging people to register for organ donation, with links to Canada's organ donor registry. (You can find the U.S. registry here.) Van Daele said he's received hundreds of letters and Facebook comments from people saying they've registered as an organ donor after seeing his pictures. “To know that this project has or will, technically, save lives — wow,” he said. Find more information about the Drawing Hope Project and organ donation. Alesandra Dubin is a Los Angeles-based writer and the founder of home and travel blog Homebody in Motion. Follow her on Facebook, Google+ and Twitter.